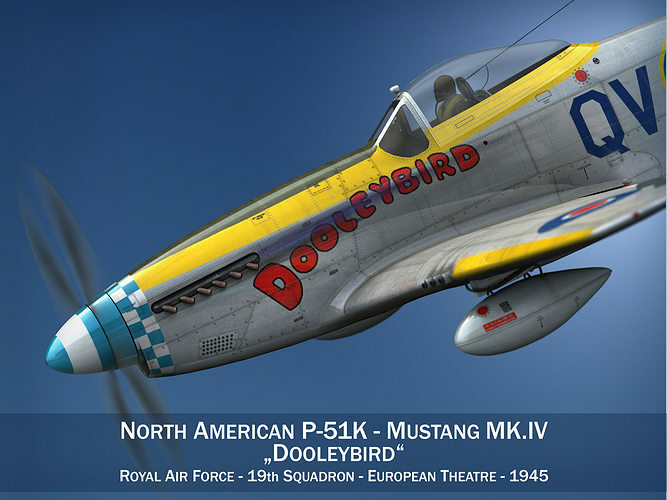 North American P-51K-10-NT Mustang MK.IVa - Dooleybird -Royal Air Force - 19 Squadron - 1945 Originally modelled in cinema4D 9.5. Detailed enough for close-up renders. The zip-file contains bodypaint textures and standard materials. Features: - Inside scene: -model - 23 textures, 2 materials, 1 alphamap - No cleaning up necessary, just drop your models into the scene and start rendering. - No special plugin needed to open scene.